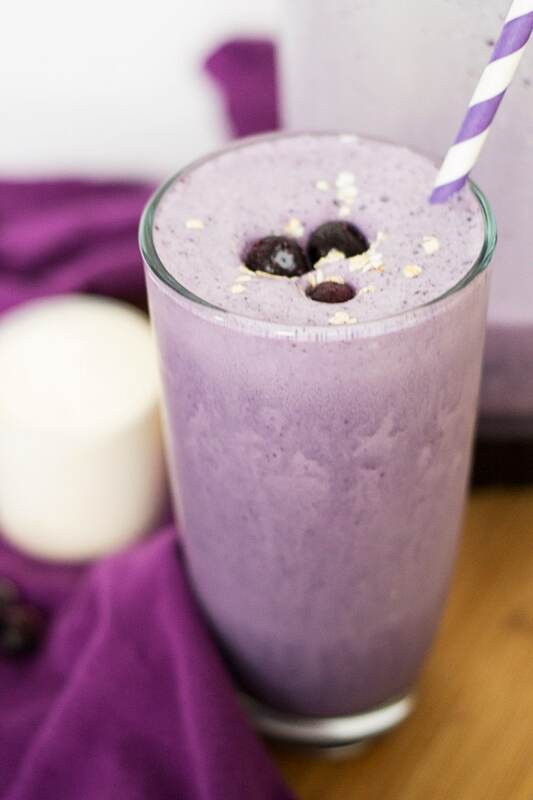 This blueberry protein smoothie is a great pre-workout boost or post-workout meal. 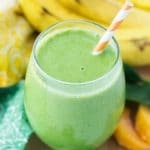 It’s packed with protein but still easy on the calories at less than 250 calories for a big smoothie. You can’t beat that! 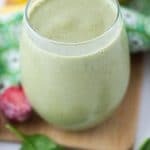 And protein smoothies are a great way to boost your protein when you’re lacking in that area in your diet. 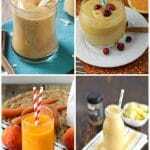 But pairing protein powder with some fruit always improves the taste enormously. We use different brand of protein powder just depending on whatever we find a good deal on. We’ve tried MyProtein, Less Naked, and some store brands. Less Naked is definitely the frontrunner (doesn’t taste fake sweet like many protein powders do), but it’s pricey. Just use whatever vanilla powder you have on hand. 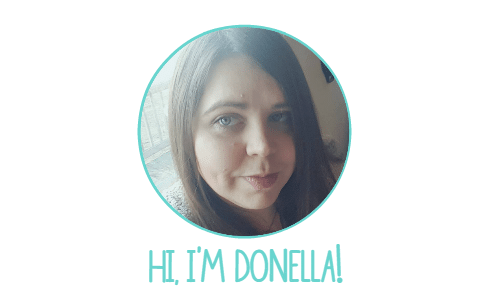 Please note, however, that the nutritional data for the recipe will be slightly altered depending on the brand you use. But in any case, you should definitely get about 20+ grams of protein in this blueberry protein smoothie. To get an even bigger kick of protein, add 1/2 cup – 1 cup yogurt or cottage cheese. 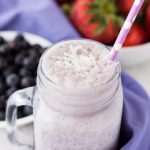 Yes, cottage cheese may seem like an odd smoothie additive, but it’s great with berries because it makes the smoothie taste a bit like a cheesecake. And who doesn’t love cheesecake? 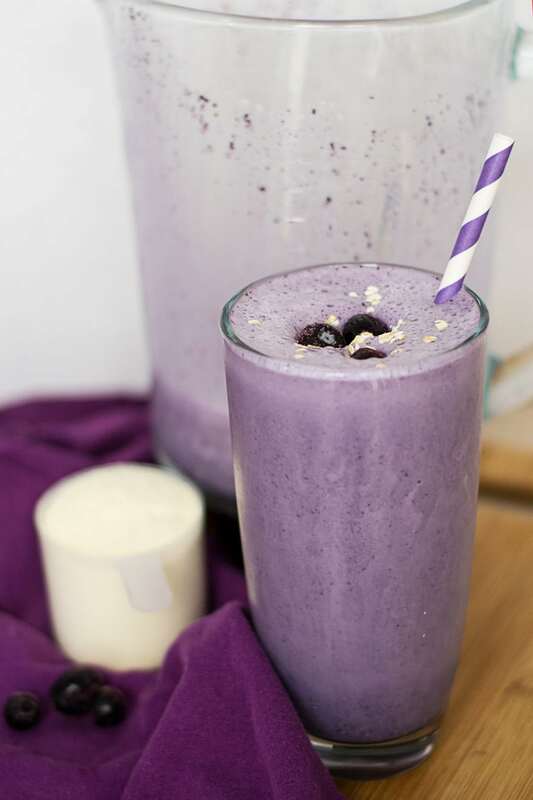 Fit more protein in your diet with this creamy Blueberry Protein Smoothie. Just use your favorite protein powder with frozen blueberries and a few other ingredients you have in your fridge and pantry. Easy! Add milk, protein powder and oats to blender. Blend until smooth and oats are no longer chunky. Add frozen blueberries, vanilla extract and ice. Blend 60 - 90 seconds or until smooth and thick. 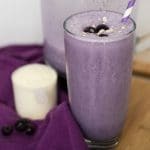 If you liked this blueberry protein smoothie, try our other protein smoothies! And check out this Blueberry Strawberry Cream Slush for the kids!